"Yet you come here in a child's uniform and you bring outsiders to our great halls." What was Worf wearing that Duras called a child's uniform? Something he wore as a child at Khitomer? According to Memory Alpha, Worf was 6 years old at the time of the Khitomer massacre. How would an adult Worf be able to wear such a child-sized item? His Starfleet uniform? In that case, wouldn't Klingons disparage all Starfleet uniforms as a child's uniform? The sleeveless Klingon cloak he wears over his Starfleet uniform? Unlikely, as other members of the High Council and Duras also wear the same garment (see picture below). 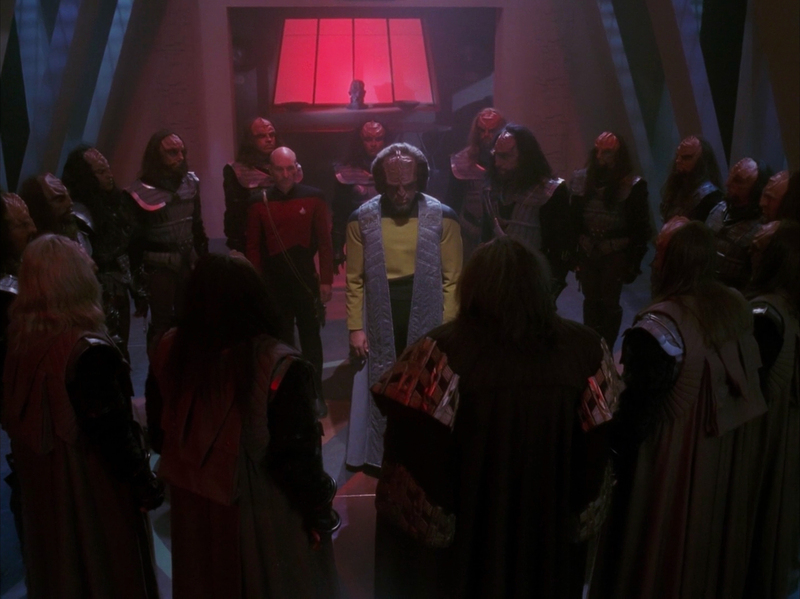 Question regarding a later episode: When did Worf get a Klingon uniform? I believe it's the third option you listed -- that the Starfleet uniform is a child's uniform. The logic is that from the Klingon point of view the ideals of Starfleet and the Federation are childish. If Duras does not call it a "child's uniform" when worn by other Starfleet officers, it's because he doesn't have any expectations that they would be real warriors like he would of a Klingon. It was a disparaging remark. Earlier in the episode, Kern makes insulting remarks about Worf's quarters being comfortable and how the Enterprise is "not the ship for a warrior, not the ship for a Klingon." TNG has several more references of Klingon's making derogatory comments to Wolf and others in Star Fleet. The first instance probably being in season one's Heart of Glory, when the two Klingons mock Worf a little for serving on a Starfleet vessel. To Klingon's, serving in Star Fleet is child's play. Humans are thought of as weak, like a child. Not the answer you're looking for? Browse other questions tagged star-trek star-trek-tng worf or ask your own question. When did Worf get a Klingon uniform? Did Worf consider any race honorable? What is the species that Worf fights on the holodeck? What is Worf referring to in “The Outrageous Okona”?